This article is about the Wiki's community portal. You may be looking for the world in the game series. 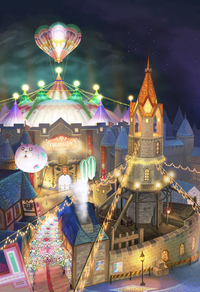 Welcome to Traverse Town, a hub for all travelers of the Kingdom Hearts Universe. To explore the wide variety of content on this wiki, just visit one of the Districts below! Visit the First District! If you're new to the wiki, you should start here! Visit the Second District! See all the sights the community enjoys! Visit the Third District! Get involved with community projects and other needed work! Visit the Fourth District! Find the wiki's popular content and learn about the wiki! Visit the Fifth District! Meet the staff! Exit Traverse Town. Don't worry, you can find us in other places, too! This page was last edited on 30 July 2017, at 15:40.